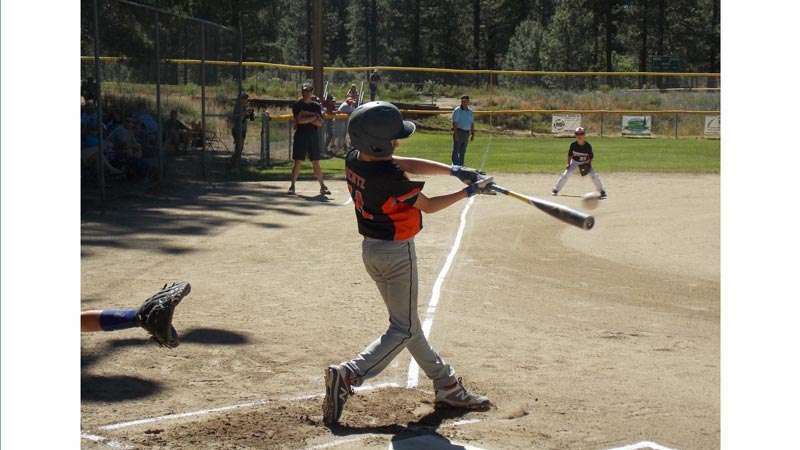 The Little League All Star team, made up of eight to 10-year-old players from Greenville, Chester and Westwood, won the District 48 Championship in Portola with a final game win over Susanville on July 2. 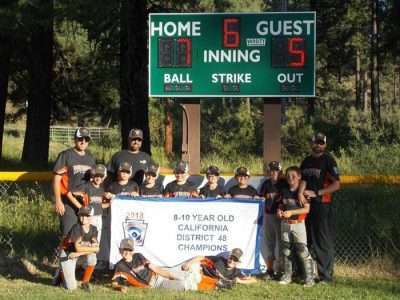 The “Almanor All Stars,” the Little League All Star team made up of 8- to 10-year-old players from Greenville, Chester and Westwood, won the District 48 Championship in Portola with a final game win over Susanville on July 2. After playing six games in seven days and beating All Star teams from Quincy, Loyalton and Burney, the Almanor team took two out of three from powerhouse All Star rival Susanville to win the District Championship. In the first game vs. Susanville, Susanville destroyed the Almanor team 14-3. Almanor was off in every aspect of the game, but rebounded in the second game, running away with it 16-4 behind a great pitching effort by Connor Bagby and great offense from every player on the team. In the final game, Susanville went up 1-0 after a first inning home run, but the Almanor All Stars hung in there, scoring a run of their own on an RBI double by Dalton Bentz. Susanville scored three more runs over the next two innings as the Almanor team committed five errors and looked defeated. However, the scrappy, spirited Almanor team rallied. They scored four runs in the third inning and another two in the fourth, bringing the score to 7-4, Almanor. With the bases loaded, one run already in, two outs and a full count to Susanville’s best hitter, the Almanor team slammed the door with a strikeout by Pitcher Owen Joseph to end what was described by many spectators as the best Little League game they had ever seen. After the game, the excited Almanor team celebrated with a successful Gatorade shower for the manager and a team “Flossing” dance session in the outfield after the game. 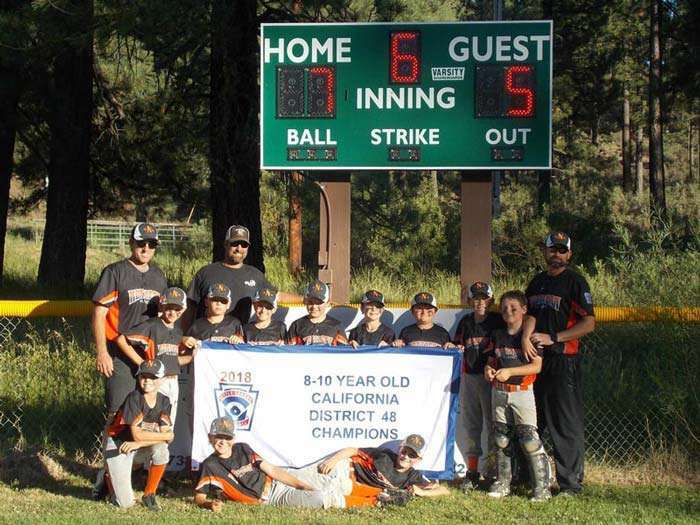 This is the second consecutive district championship for the Almanor team, beating Susanville both years, and is the second time in each small town’s history that their eight to 10-year-olds have advanced to the Sectional Tournament. Starting pitcher Dalton Bentz got the win, struck out 10 batters in five innings of work and added three hits on offense. Owen Joseph pitched well in relief, earned the save and was on base two times. Zack Smith had a timely hit to drive in the tying run and Alden Burnett and Connor Bagby each had a pair of hits in the game. Every player on the Almanor team had at least one hit in the game. The next game for the Almanor All Stars takes place Friday, July 13, vs. Marysville in McKinleyville at the Sectional Tournament.